The manuscript collection of the Leiden University Library contains much interesting historical manuscript material about the Chinese presence in Southeast Asia. Koos Kuiper has published a very useful guide to these sources. Catalogue of Chinese and Sino-Western Manuscripts in the central Library of Leiden University (2005). Owing to the inclusion of the libraries of the KITLV and the Sinological Institute, two institutions which sadly enough were decapitated a few years ago, much interesting source material has been added but is waiting to be integrated in a new vastly expanded guide book. For those who are specifically interested in Chinese source materials about Chinese life on Java from the late eighteenth century until the early twentieth century the Kong Koan archives that were acquired in the 1990s are of course of prime interest. In between 2001 and 2017 all the Chinese language Gongan Bu 公案簿or Minutes of the Board Meeting of the Kong Koan have been published by a team of Leiden and Xiamen University in 16 volumes under the direction of Prof. Nie Dening 聂德宁, Dr. Wu Fengbin 吴凤斌 and myself 包乐史. These source materials constitute a treasure trove for historians working on the social and economic history of overseas Chinese communities. In my talk I should like to focus on another very useful manuscript the so called Annals of Batavia 开吧历代史纪, a Chinese history of the Chinese community of Batavia (1609 – 1800) written by an anonymous author at the end of the eighteenth century. The Sinological Institute already had a copy of this manuscript but quite recently a slightly older and more original version was donated to the Friends of the Kong Koan Association which has given it on loan (or in the meantime may already have given it) to the University Library. Nie Dening and I have recently published with Brill Publishers The Chinese Annals of Batavia an annotated English edition of this history largely based on Chinese oral tradition and some Dutch written source material. In my talk I shall focus on the composition and the contents of this curious hybrid Chinese urban history and suggest who the author may have been. Een Zwitsers Leven in de Tropen, De lotgevallen van Elie Ripon in dienst van de VOC (1616-1626). Amsterdam: Bert Bakker 2016. Visible Cities, Batavia, Canton and Nagasaki and the Coming of the Americans, Harvard UP, 2008. Bitter Bonds, A Colonial Divorce Drama of the Seventeenth Century. Princeton: Markus Wiener Publishers. 2002. Strange Company, Leiden: KITLV Press 1986. ‘China’ is a problematical concept for the premodern period because the name unavoidably invokes the fixity of a modern nation-state that maps poorly onto the various and ever changing political formations of earlier centuries. Global history (in contrast to World History) may offer solutions for how to address the premodern era without reliance on anachronistic national frames. The concept of technologies, broadly understood, invites us to trace the use of practices and ideas regardless of political or ‘ethnic’ boundaries, which in turn necessitates reconfiguration of the region under consideration, in this case as Eastern Eurasia. This paper takes technologies of movement – specifically oceangoing ships active in the South China Seas – as cases through which to reframe our understanding of premodern Eastern Eurasia with interactions and relationships at the core of a non-sinocentric analysis. Naomi Standen is the first non-Europeanist appointed as a Professor of Medieval History in the UK. Her research started from a fascination with the ground-level functioning of borderlands, especially in the Liao (907-1125), and from there has expanded in both time and space. She works with texts, with archaeologists and with medievalists studying all parts of the globe. Publications include Unbounded loyalty: frontier crossings in Liao China (Hawai’i, 2007), and The Global Middle Ages (ed. with Catherine Holmes, the Past and Present supplement for 2018). She is writing a global history of eastern Eurasia between the 7th and the 14th centuries. Op deze avond vieren we de kracht van taal en poëzie en in het bijzonder onze nieuwste uitgave Mantsjoes toen en nu in gedichten en gebeden. We doen dit met drie prachtsprekers. Je zult op het puntje van je stoel zitten. Jo DE BAERDEMAKER ofwel Typojo laat ons toe in zijn wereld van letterontwerp. Jo gaf verschillende kwetsbare talen een gezicht door middel van fontontwerp. Hiermee gaf hij niet alleen een practisch gereedschap aan de taalgebruikers, maar ook een stuk eigenwaarde. Want, denk je in: wat zou het betekenen als er geen letters zijn om Nederlands mee te typen? Tsead BRUINJA zal voordragen uit eigen werk, dat zich splits in Friese en Nederlandse gedichten. Hoe deel je jezelf als je in twee moedertalen dicht? Naast de gedichten zelf, zal Tsead ook over die vraag een boekje open doen. Tsead zal zeker ook lezen uit zijn nieuwe bundel Hingje net alle klean op deselde kapstôk / Hang niet alle kleren aan dezelfde kapstok. Fresco SAM-SIN zal in zijn presentatie de Mantjoe sjamanen, khans, soldaten en het gewone volk een stem geven. Bijna 300 jaar een wereldmacht en toch nog zo onbekend. En hoe mooi als we de Mantsjoes kunnen leren kennen door hun, voor het Nederlandse publiek, compleet onbekende literatuur. Dat is precies wat Fresco zal doen. Bijna drie eeuwen lang heersten de Mantsjoes over een van de grootste landrijken ooit, de Daiqing (1636-1912). Na de val van hun rijk viel de Mantsjoes haat, hoon en onderdrukking ten deel. Fresco Sam-Sin zal met gedichten en gebeden het lot van de Mantsjoes aan u introduceren: van bidden in het wild en in het donker, via lof-, hof- en liefdesverzen, tot trauma op rijm en burleske macaroni om te eindigen met beelden en geluiden van moderne poëzie. Welke invloed hebben de gebeden en gedichten van toen op de dichters en sprekers van nu? abstract: The Messiah Sutra and On One God are two ancient Chinese manuscripts that are taken as the earliest statements of the Christian faith in China. According to the conventional understanding, they were created by the first known Christian missionary Āluóběn 阿羅本 around the 640s. In this talk I will show that, relying on the name taboo tradition and the use of the bèi 被passive construction, one can make the case that the two texts were created most likely no earlier than the period of the late Tang and Five dynasties (800-960). These results have consequences for the traditional narrative of Christianity in pre-12th-century China. The Manchu Foundation would like to invite you to the free event ‘Debtelin 2’, during which the second edition of Debtelin will be presented. DEBTELIN 2 explores the literature, art, culture and poetry of Manchu Archery. Translations and preparations are executed by Manchu students around the globe, supervised by Peter Dekker and Fresco Sam-Sin. Debtelin 2 comes with a poster and a website full of extra material. There will be a Q&A with the main contributors of this edition: Fresco Sam-Sin, lecturer of Manchu and Manchu Studies at Leiden University, and Peter Dekker, specialist in Manchu Archery. Peter will bring real antique Manchu weapons with him. Enough to see and talk about! For more information and registering, or perhaps already buying your own copy, please go to https://www.eventbrite.nl/e/tickets-debtelin-2-event-43226577858. Last presentation of this season! note: the talk originally planned for 29 November has been cancelled. abstract It is well known that social changes have an impact on language variation and change. Nowadays, Beijing witnesses radical social changes in the process of urbanization. Erhua, as a characteristic feature of Beijing Mandarin, is undergoing a change with the change of society. In this talk, I will present some preliminary findings related to the social stratification of erhua and people’s attitudes towards erhua. 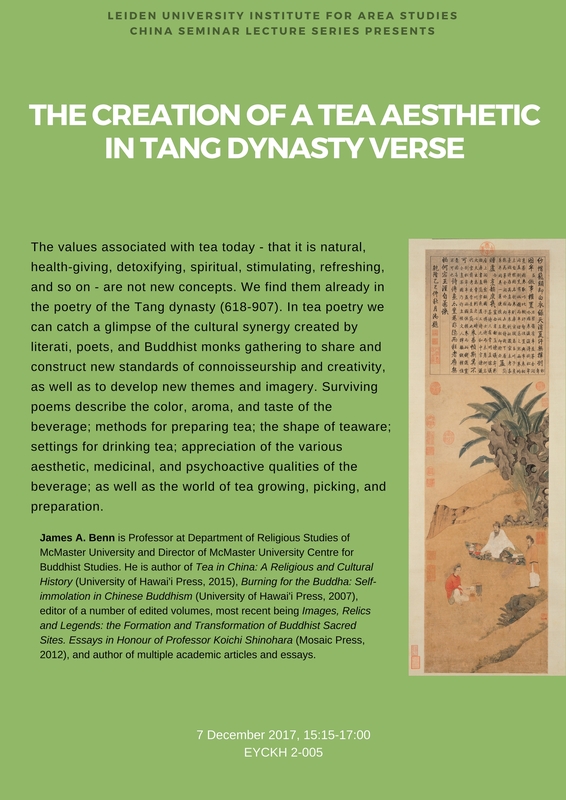 Abstract: The values associated with tea today— that it is natural, health- giving, detoxifying, spiritual, stimulating, refreshing, and so on— are not new concepts. We find them already in the poetry of the Tang dynasty (618-907). In tea poetry we can catch a glimpse of the cultural synergy created by literati, poets, and Buddhist monks gathering to share and construct new standards of connoisseurship and creativity, as well as to develop new themes and imagery. 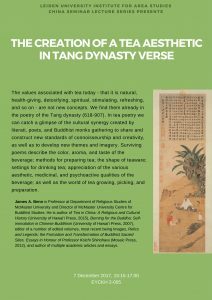 Surviving poems describe the color, aroma, and taste of the beverage; methods for preparing tea; the shape of teaware; settings for drinking tea; appreciation of the various aesthetic, medicinal, and psychoactive qualities of the beverage; as well as the world of tea growing, picking, and preparation.